RDF is the data model of choice for Semantic Web applications. RDF graphs are often large and have heterogeneous, complex structure. Graph summaries are compact structures computed from the input graph; they are typically used to simplify users' experience and to speed up graph processing. 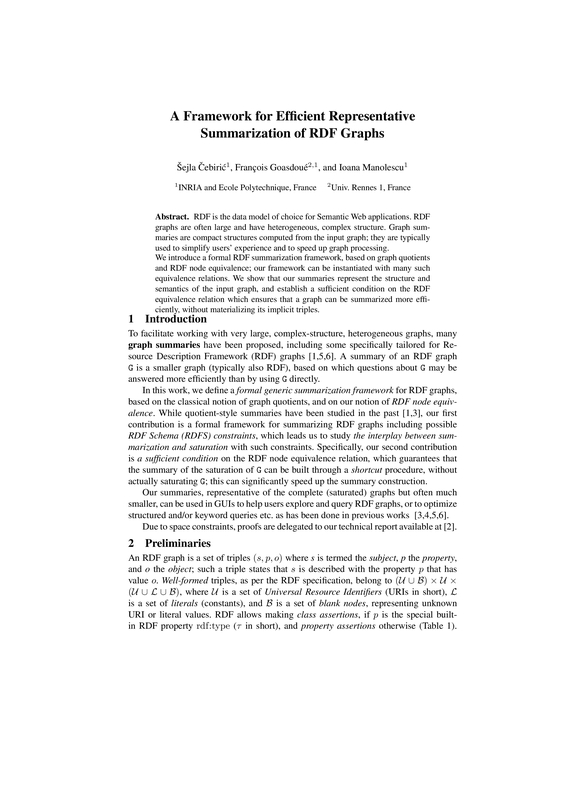 We introduce a em formal RDF summarization framework, based on graph quotients and RDF node equivalence; our framework can be instantiated with many such equivalence relations. We show that our summaries represent the structure and semantics of the input graph, and establish a sufficient condition on the RDF equivalence relation which ensures that a graph can be efficiently summarized, without materializing its implicit triples.